We landed in Florence in the early afternoon, after a relatively painless six-plus-hour flight across the Atlantic, with a layover in Amsterdam. 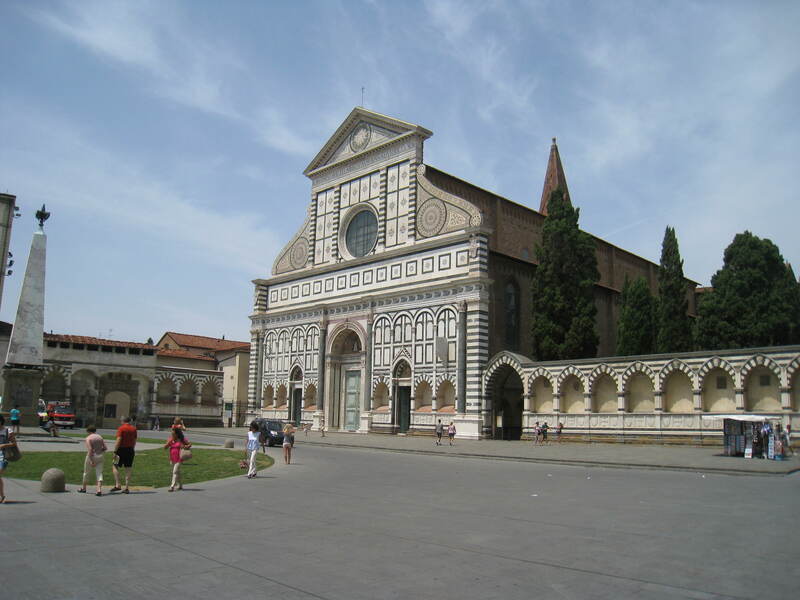 Upon reaching our hotel, Hotel Rosso 23, nestled in the Piazza Santa Maria Novella, we debated for a whole three-minutes if we should walk around the city or take a nap and hope we didn’t sleep through the day. We walked. Of course. We snaked through the city’s streets and pathways, pausing every few seconds for me to take a picture of this building, or this pathway(I would take close to 1,800 pictures while on this 2-week Italian sojourn. My philosophy is: we have technology to take an infinite amount of pictures. Why wouldn’t you? You don’t have to pay for film or developing. You take the picture and upload it to your laptop – in my case, iPad – and sort them upon your return). A few rights, a couple lefts and then we see it peek over the four or five story buildings that comprise the city: the Duomo. Being that the lines were super long and it was super hot, we decided to keep walking through the city. Actually, we were both starving and in the hunt of the perfect sandwich. A few friends of mine and a friend of hers, who do not know each other, all suggested we find this small shop called I Fratellini. It took us quite some time, but we allowed ourselves to get lost and after exploring piazzas and small streets, we came upon this little hole in the world. And yes, it was a perfect sandwich. The rest of the day, what was left of it, was spent walking through the leather section and investigating the area surrounding our hotel. By the time 9pm rolled around, I was already in a deep slumber, dreaming of the days ahead. The alarm clock went off at 6:30 in the morning with artificial sounds of birds chirping. Well, that’s not entirely true. It wasn’t an alarm clock, but an iPad app. In a city that has paintings older than any city in the US, this morning’s wake-up call served as an immediate reminder how technology has given our society a rebirth. Well, maybe rebirth is not the appropriate word. Maybe it’s democratization; technology gives anyone the ability to wake up to the sound of artificial tweets. If Florence, as the birthplace of the Renaissance, never let’s you forget what the human species can do when we use our brains, then the Uffizi shows us how insignificant, yet immortal we can be. The Uffizi is one of the greatest museums in the world, but didn’t start out as one. The Uffizi, which started construction in 1560, was meant as offices (Italian for “offices”? Uffizi.) for Florentine magistrates and leader of the pack, Cosimo de’ Medici, the Grand Duke of Tuscany (not to be confused with Cosimo de Medici, the founder of the Medici clan). Cosimo also wanted a place to arrange and store some of the works of art he collected, and over the years, additional Medici family members added their works – whether ones they bought or ones they had made for them. In the mid 18th century, the gallery was officially opened to the public, where each year about 1.5 million tourists walk through and gape at some of the most amazing artwork in history. (Just make sure to get tickets before hand; I read people wait for many hours if not – we got ours and walked right in. In fact, at any museum/historical/archaeological site throughout Italy, be sure to get tickets prior to going). You see artifacts and art from as early as the 4th or 5th century, but the main draw is the collection from the 13th century up through the 1600’s. And, you see a recurring theme: the influence of the Church. Paintings of Christ – both cute chubby baby Christ and gaunt, hanging on a cross Christ – fill up most of the walls. And then there are the frames; these things are as opulent as the paintings are ornate. 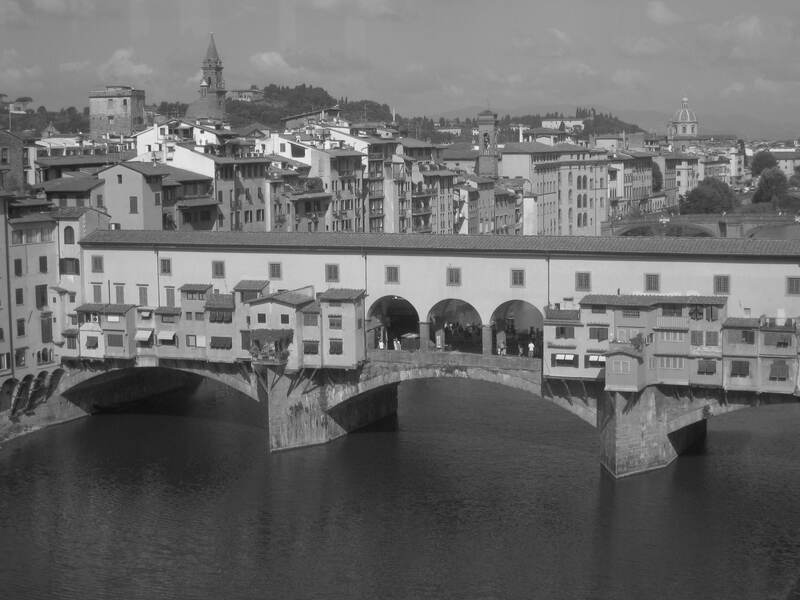 The Ponte Vecchio, as seen from the Uffizi. Following the Uffizi, we continued to traverse through the Cradle of the Renaissance, and ended up at the Mercado Central, a place where the colors of the fruits and vegetables are as bright as I’ve seen, and where the butchers proudly display their meats – cured or otherwise. The Accademia has been the home to Michaelangelo’s David since the late 19th century, as well as his unfinished “Prisoners,” where you can see chisel marks. I stared at these unfinished works of art and thought, “I wonder what he would have done with AutoCAD.” And while there are other paintings from the Renaissance, the main draw is David, one of the most beautiful things I’ve seen. The statue, so life-like, actually made me tear up a bit. It’s that stunning. 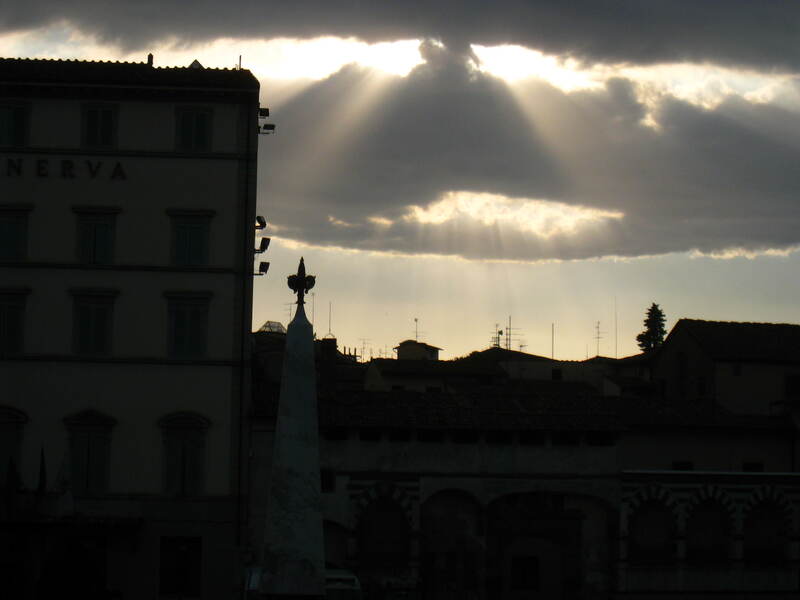 After dabbing my eyes with my sleeve, we left David upon his pedestal and re-entered the hot Florentine sun. 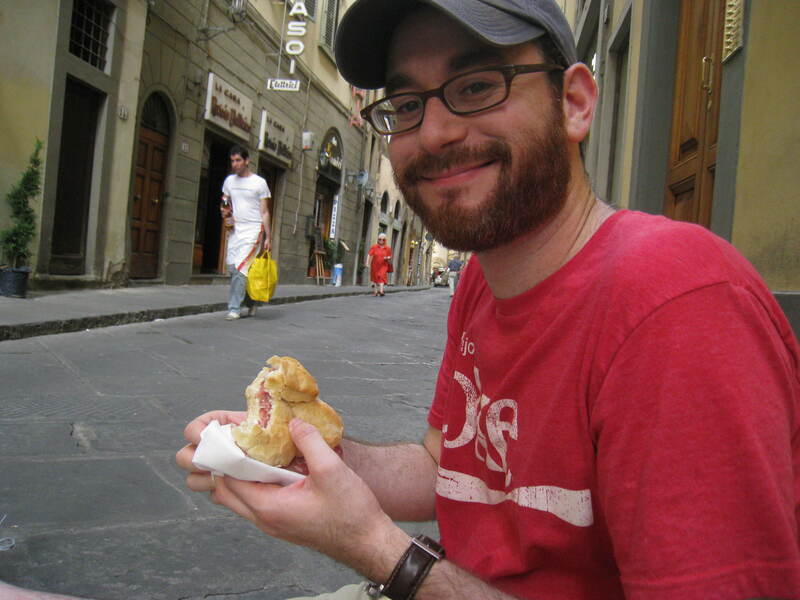 We walked a little more and ended up near the only synagogue in Florence and went in for a tour. The building was built in the Byzantine-style, with domes and a busy, yet beautiful interior, where like other Sephardic shuls, the Bima is in the middle of the sanctuary away from the alter, where the Arks are held with Torahs. Any time we travel, we look for synagogues. In our way, it serves as connecting our roots, our history, with those who paved the way for us to survive. 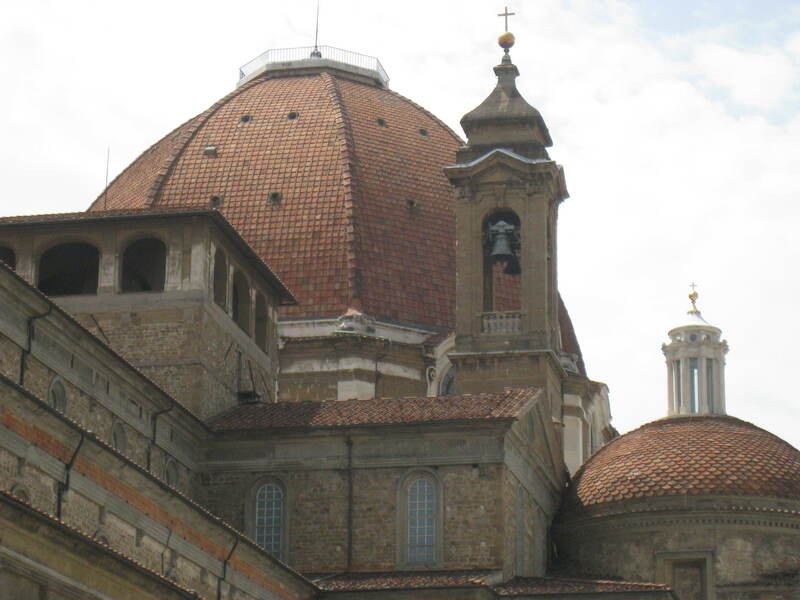 This was another one of my favorite buildings in Florence. If you couldn’t tell by now, the architecture throughout the city is remarkable. Structures built in the 1300s and rebuilt in the 1500s still stand. Churches, plazas and footbridges connect the city to its citizens as well as past generations. The Duomo, the unmistakable looming dome, again reminds visitors that even the Empire State Building is just another building. The next morning, we again woke to the sounds of fake birds chirping so that we could get an early start to the day and climb Giotto’s Bell Tower. 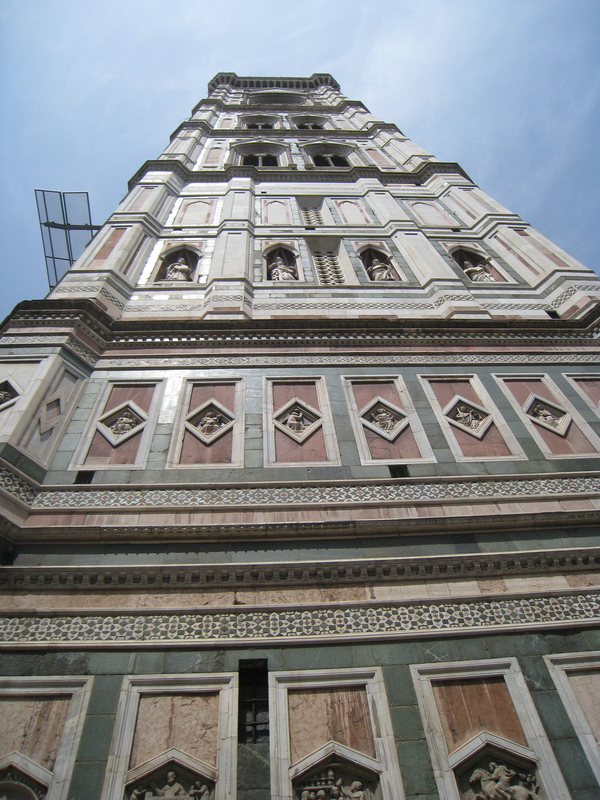 416 steps to the top, with three ‘floors’ along the way to catch your breath and take a picture of some bells. Most of the steps were easy(ish), though no hand rails. There was a stretch, however, of about 25 steps that instead of going straight up, twisted and curved and most importantly narrowed. This is not a climb for the faint of heart, or the clumsy. 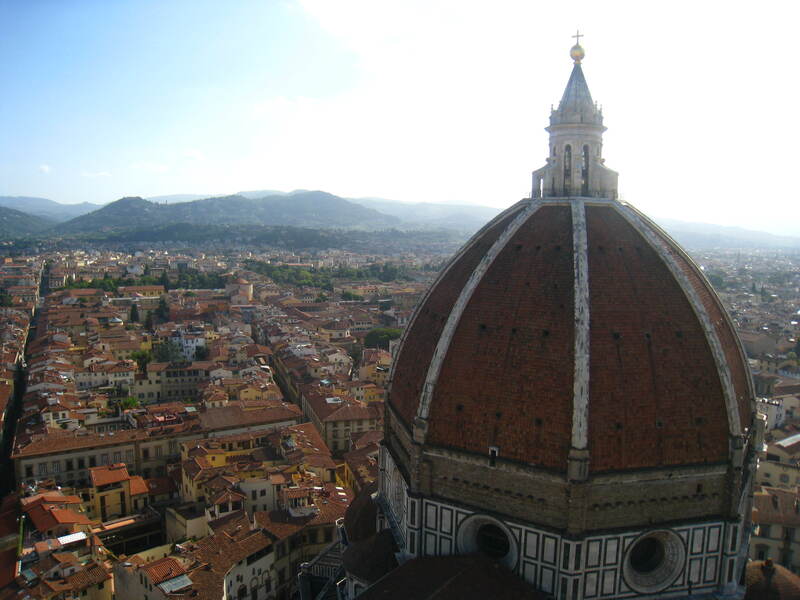 After the 416th step, you reach the top floor, and another couple of short steps and you are overlooking Florence, standing over the city that changed Western society – and the world. You look down and think, people built this. Without electricity. Without advanced machinery. Without computers. People – their brains and their hands. Strange as it may seem, I had a vision of standing atop another great building. Standing on top of the World Trade Center was unfathomable as a 9 year old. I couldn’t comprehend how they built buildings so tall, that you could look over New York City and its skyscrapers, and out into New Jersey or Brooklyn or Queens. My dad even told me he could see our house from there, but I didn’t think his eyes could see out to Long Island. In Florence, you see the city and you see the mountains. When you’re in the city, you have no idea mountains even exist, as you nor they are high enough to see them. Unless you walk up Giotto’s bell tower or the Duomo itself. I suggest the Bell Tower for two reasons: it’s cheaper and there are zero lines. The Duomo is 10 or so steps higher, but when you’re on top of the Bell Tower, you can see the top of the Duomo in all its beauty. We were there for 2 nights, one full day, and I need to go back. I need to see other sections of the city I’m sure I missed, like the Palazzo Pitti or head out to Pisa to see some more ruins. When people ask what was my favorite part of the trip – we also went to Siena, Singalunga, Rome, Positano and Pompeii – there are so many highlights, but the first thought I have is of Florence. The food, the buildings, the history, the importance, the art, and of course, the people. Overlooking Florence from atop Giotto’s Bell Tower. Duomo on the right.